Ringgold, GA -- The Share America Foundation, Inc. announced its third 2014 scholarship winner recently at the Ringgold Depot in Ringgold, Ga. 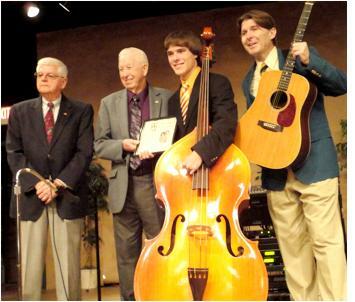 Fiddler Emerald Butler of Sale Creek, Tenn. was selected as the third 2014 scholarship winner. 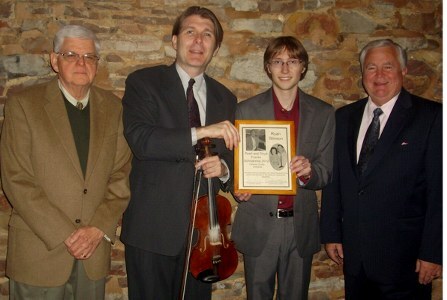 The Share America Foundation, Inc. announced its first 2014 scholarship winner recently at the Ringgold Depot in Ringgold, Ga. Fiddle player Wil Markham of Signal Mountain, Tenn. was selected as one of the 2014 winners. Markham is the son of Skip and Harriet Markham of Signal Mountain, Tenn. He is the grandson of Wilbourne and Delores Markham and Phil and the late Stuart Wilkerson. The Share America Foundation, Inc. announced its first 2012 scholarship winner recently at its Sacred Sounds Fridays concert featuring Archie Watkins at the Ringgold Depot in Ringgold, Georgia. Ryan Stinson, 22, of Ringgold, Ga. was selected as the 2012 Catoosa County designee. He attends Luther Rice University and Seminary and is a beginning senior. The Share America Foundation, Inc. announced its second 2011 scholarship winner recently at its Sacred Sounds Fridays concert featuring Testimony Quartet at the Ringgold Depot in Ringgold, Ga. The scholarship was awarded to Mike Holloway, 18, of Signal Mountain, Tennessee, who graduated from Signal Mountain High School and now attends University of Tennessee in Knoxville.